Our new website makes it clear that we have a superb range of standard enclosure hardware products for Industry, Transport and Electronics which for most customers forms the backbone of their requirements – but of course in order to produce these high quality locks, handles, swinghandles, hinges and sealing profiles we have had to develop tremendous expertise in all the relevant technologies – which we can also apply to the production of custom products and customer standards. 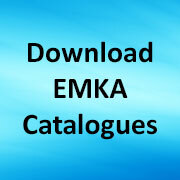 So it is that EMKA has become an expert in the casting of stainless steel, spraying of zinc and high-performance plastics as well as in the extrusion of rubber and plastic profile. Punching, bending, turning, milling, surface coating or powder coating as well as the final assembly and testing of the modular product program so ensuring a unique vertical integration. Naturally the skill and knowledge behind this expertise resides in our experienced team of designers, developers and engineers who are available for the creation of individual customer product solutions. The Production Division can therefore offer production to individual customer drawings allied to ultra-modern machinery and extensive know-how of the different manufacturing technologies to allow maximum material and variant diversity. Contact us in Coventry to discuss your standard or custom hardware needs. Share the post "Solutions for your enclosure hardware needs"